Στην περιοχή Καμ Τσάου, το Hoi An Golden Rice Villa αποτελεί ιδανικό σημείο για να εξερευνήσετε την πόλη Hoi An και τα περίχωρα. Μόνο 30 km μακριά, αυτό το 2.5 αστέρων ξενοδοχείο είναι εύκολα προσβάσιμο από το αεροδρόμιο. Με την βολική του τοποθεσία, το ξενοδοχείο προσφέρει εύκολη πρόσβαση στους προορισμούς της πόλης που πρέπει οπωσδήποτε να δείτε. Το Hoi An Golden Rice Villa προσφέρει άψογη εξυπηρέτηση και όλες τις βασικές ανέσεις στους ενθουσιώδεις ταξιδιώτες. Το ξενοδοχείο σας παρέχει 24ωρη υπηρεσία δωματίου, δωρεάν WiFi σε όλα τα δωμάτια, 24ωρη φύλαξη, παντοπωλείο, ημερήσιος καθαρισμός. για να εξασφαλίσει ότι οι πελάτες μας θα απολαύσουν την μεγαλύτερη δυνατή άνεση. Επιπλέον, όλα τα δωμάτια διαθέτουν ποικιλία ανέσεων. Πολλά από αυτά παρέχουν ακόμη και ντουλάπα, δωρεάν τσάι, πετσέτες, παντόφλες, επιπλέον τουαλέτα προκειμένου να ευχαριστήσουν ακόμα και τον πιο απαιτητικό επισκέπτη. Το ξενοδοχείο προσφέρει υπέροχες ψυχαγωγικές εγκαταστάσεις όπως οι σνόρκελινγκ, εξωτερική πισίνα, καταδύσεις, ψάρεμα, παιδική πισίνα για να είναι η διαμονή σας αξέχαστη. Το Hoi An Golden Rice Villa είναι ο ένας και μοναδικός προορισμός για εσάς που ψάχνετε ποιοτικά καταλύματα στη Hoi An. I've lived and traveled all over SE Asia for 12 years. This is the best value ever. It's a lovely place with very personal, friendly service. It's a little ways outside of the main city, but the bike ride into town is a pleasant 15 minute ride with shops & cafes along the way. Very nice small hotel. Good staff. In the rice fields not too far from Cua Dai beach or Ang Bang, Lucky and Hidden beaches yet only not quite 3 Klms from the Old Town. Bicycles are available but we also chose to walk a number of times and was very easy going through the rice fields. A 10 minute or so walk will find you at Cua Dai Road where you will find some good restaurants, deli's and a local market. The family who own the villa are very friendly and make you feel like at home. The pool was good but could probably do with a bit of afternoon shade to keep the water cool. The pool side rooms were very large with comfortable beds, good value for money we thought. Loved our stay here. Beautiful large room-views out to paddy fields and swimming pool. Reasonable mini bar and a generous made to order breakfast every day. Really warm and friendly staff. Recommended. 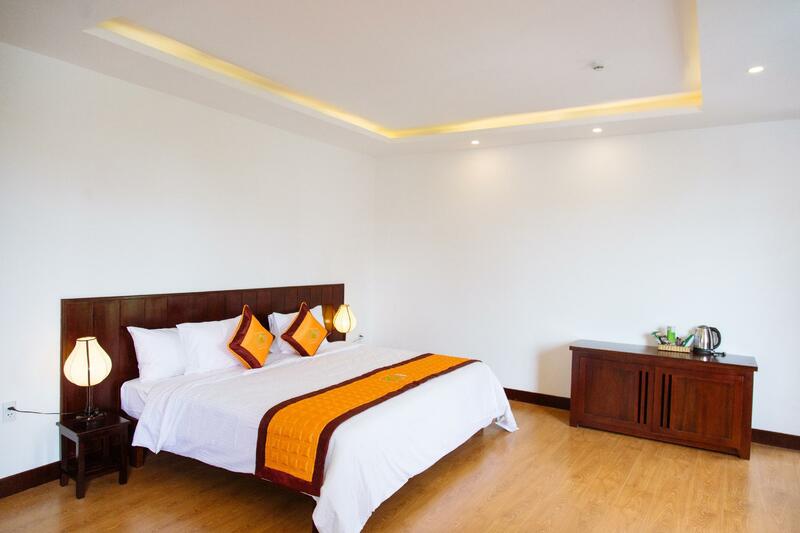 This villa is good and near to the Hoi an ancient city . They provide free bicycle. room is clean and spacious and comfortable too. We planned to stay one night and ended up staying four days! We loved our room and it's large balcony. The resort is in a nice quiet location not far outside the old City. If you want to take a detour, there are awesome small roads through the rice patties all around the resort. They offer free bicycles and cheap motorbike rentals. I definitely recommend this place to couples or families. Wouldn't necessarily recommend it to young party animals though. The family running this business is very kind and helpful. The rooms are new, large and comfortable. 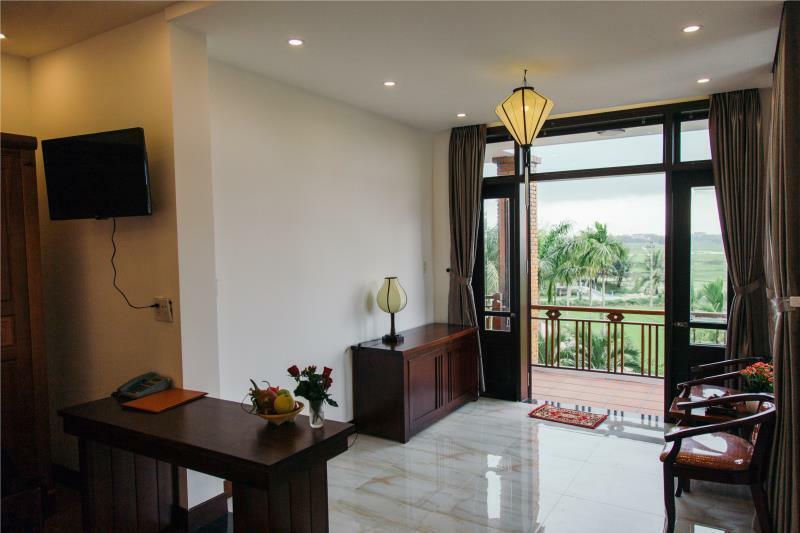 Beautifully located in a pristine area of Hoi An with beautiful open views towards the rice field. Pro : pastoral scene, nice swimming pool etc. Deluxe room is excellent but superior rooms lack of sound-proof ; you have to bear all those sounds from next doors. We stayed at Golden Rice Villa for 5 nights last week and it was wonderful. The family are absolutely lovely, very helpful and are really trying to make their guests happy and comfortable. The hotel looks out over paddy fields and has free bikes you can use to cycle round them, into Hoi An and to the beach. It is very peaceful and quiet. Lovely pool. The rooms are Huge! Very comfortable beds and they have a bedside light which a lot of places don't. Nice big bathroom with rainforest shower - its a wet room which is not my personal taste but very well done and with toiletries and a hairdryer provided. Big kettle and a fridge in the room too. The hotel is about 15-20 mins by bike (riding pretty slowly) into Hoi An. We loved our time there and will definitely return. Thank you to all the staff for such a wonderful stay!! 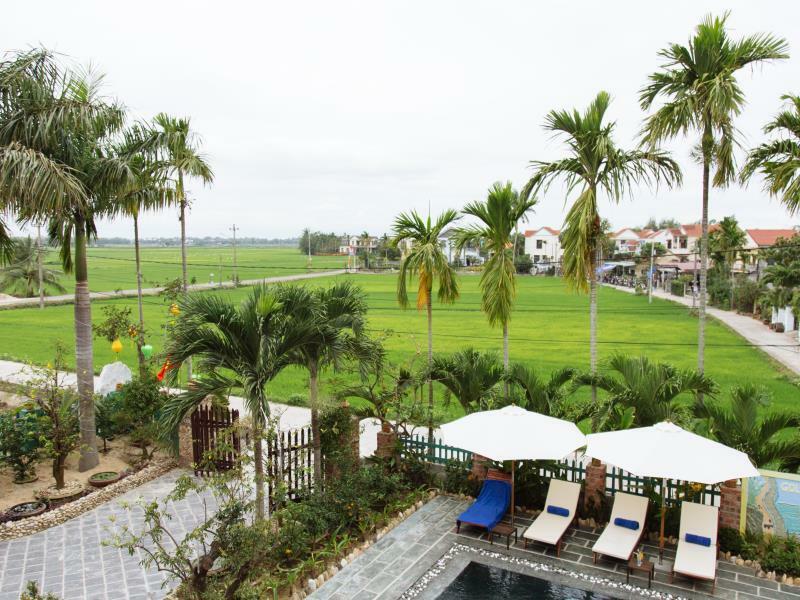 good value, clean, good breakfast options, wake up to views of rice paddies. bikes are free, 20 min walk into old town. hotel is mid-way between beach and old town. recommended. A lovely place to stay in Hoi An, the rooms were gigantic and very comfortable. The pool in the Villa is lovely and its a great place to enjoy a morning or an evening swim. Stuff in the hotel is very kind and helpful. On the spot you can enjoy free bicycles which come in handy if you want to go the beach or to the old town of Hoi An. A nice choice of breakfast and fresh juices. This homestay, including pool, was a great catch! very clean, great family who runs the place and a great location (even has free bikes you can take whenever you like to explore the surroundings and the old quarter)! Would definitely recommend this homestay! This can't be beaten for the warmth and hospitality. Delish meals. clean. Beautifully appointed. Staff so helpful kind and so far best yet in our Vietnam travels. Hoi an a restful mecca. Highly recommended. We came to this haven after quickly fleeing another substandard hotel for same price. Incomparable. Die Villa liegt leiht außerhalb was aber kein Problem darstellt weil es quasi für jeden Gast ein kostenloses Fahrrad gibt. Wahlweise kann man auch den Roller für 6 Euro pro Tag mieten. Dafür hat man absolute Ruhe und die Natur vor Augen. Das Ideale Hotel um sich von dem Lärm der Städte zu erholen. Der Pool ist zwar nicht riesig reicht aber zum planschen und ist super gepflegt. Die Zimmer sind super eingerichtet und sauber. Und das Personal ist immer freundlich und super hilfsbereit ohne einem direkt ne Tour aufzudrängen. Einfach buchen. Da macht man nix falsch. Accueil chaleureux. Le staff et proprio sont à l'écoute et disponible. Situé dans les rizières, mais proche du vieux Hoi An, l'hôtel y est paisible avec un environnement enchanteur. Le prêt (gratuit) de vélos est très apprécié. Bon petit déjeuner inclus. Moi et mon conjoint avons également commandé 2 fois pour le repas du soir et le tout était très bon. Notre chambre était spacieuse, propre (tout comme le reste de l'hôtel) . Hoi An Golden Rice Villa est mon meilleur hôtel au Vietnam et à petit prix.